When you look at the Jeep Compass, you'll see that it has a bright future ahead. 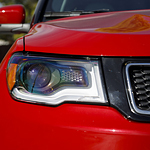 The headlights are illuminated with LED bulbs, giving you the maximum glow while driving at night in Merced. The taillamps are designed with LED bulbs as well. The trunk of the Compass is spacious with a tailgate that easily lifts to allow for accessing the storage area. All you have to do is press a button for the lift to open and close. Another easy area to open is the sunroof. It gently slides open and closed with little sound, giving you fresh air and plenty of sunshine while you're driving. There are several classic design details that you are likely accustomed to finding on a Jeep SUV. The grille features the iconic spaces and sporty design. You'll also see the classic arches of the wheel wells on the Jeep Compass while exploring vehicle options at Razzari Chrysler Dodge Jeep Ram.